Deadpool’s Secret Secret Wars might just be the best thing to come from Marvel’s ongoing Secret Wars event. It’s not only filled with brilliant deep cuts for the classic ‘80s comic crossover, but it’s irreverently funny—and this week, it takes on the most iconic moment from the original event. 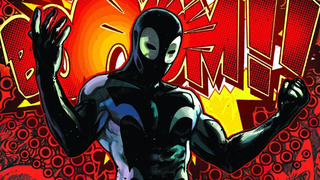 Minor spoilers ahead for Deadpool’s Secret Secret Wars #3 ahead. Yup. Deadpool not only pegs the symbiote as an alien entity from the get-go (unlike Spider-Man), but he’s also seemingly responsible for turning into the crazy, twisted creature it is. And he still sends Spider-Man on his merry way to get the suit, knowing full well what will happen. Fantastic. If you’ve got an affinity for the original Secret Wars and classic ‘80s Marvel in general, you really need to be checking out Deadpool’s Secret Secret Wars. It’s brilliant.